I had the pleasure of photographing Megan and Joe's wedding on Saturday at St Giles the Abbot, Farnborough Village and The Bull's Head Hotel, Chislehurst. It was another day that threatened rain but then didn't deliver. In fact, the conditions turned out to be perfect for photography. The vicar (not the usual incumbent of the church) conducted one of the warmest and most charming services I've ever heard - a real credit to the church. He also gave me an incredibly friendly welcome. If only all vicars could be like this! Megan and Joe have gone off to Tanzania on honeymoon and asked if I could delay publishing their full gallery until their return. 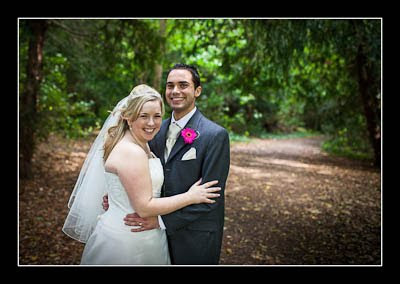 I did, however, manage to publish a sneak preview of photos on Facebook before they left - check out their wedding gallery. David, I notice most of your brides leave feedback after you photograph their weddings. Is this one of your requirements for them to send you feedback? I get some feedback from brides, all good. However not every time, they don't send any emails. I do not ask them to email feedback, so how do you get everyone emailing you nice messages? No, there's no requirement to leave feedback. I don't think it would be enforceable! I just always try and exceed expectations - not just in terms of the photographs but in my dealings with people before, during and after the wedding. People then tend to be very loyal in return. Marrying (no pun intended) good technical skills with good people skills is the basis for a successful wedding photography business IMHO. And well done to you for the fabulous reading during the ceremony. Now I have seen all photos from Megan and Joe´s wedding. I am really impressed! !